Dexter Daily: Jennifer Carpenter: "I Was So Green the First Season - I Barely Knew How to Hit a Mark"
Jennifer Carpenter: "I Was So Green the First Season - I Barely Knew How to Hit a Mark"
Ron Bennington: Jennifer Carpenter is in with us. “Dexter”, this show is turned on it’s ear, this year. I’ve been there since the beginning. And I’ll just say this. This is the first season I’m actually mad at Dexter. Because I think he’s chosen himself over his own sister. And up to that point – remember how many times over the years he would be saying – Oh, I have to protect blah, blah, blah. This year, I think he’s put it all on her. Jennifer Carpenter: I agree. I’ve lived the last 7 years feeling that way. And I feel like now we’re finally talking about it. Jennifer Carpenter: Maybe he’s not a super hero. Ron Bennington: And it was – well, here’s the thing too. I was like – first of all, the shock of him actually being found out by you – because in the back of my mind, this was going to be the last episode. I didn’t think you would be able to find the story for it, but this year has been maybe the best year ever. Ron Bennington: So you agree that Dexter has kind of shown more true colors this year into who he really is. Ron Bennington: It’s been a lie. Jennifer Carpenter: But, yeah. But now he’s got his wish and he’s discovering what it’s really like to be a real boy and live with things like shame and guilt, frustration, anger. Ron Bennington: See, for many years, I was like buying into that it’s about addiction or whatever for him, but now this year, I’ve changed my mind – this is a story of abuse. He was abused and I feel like he’s abusing his sister because he’s using seduction. He’s using family history. I think he’s very cruel to Deb this year. Jennifer Carpenter: I agree, but I wouldn’t dismiss the addiction part either because he does sort of have the traits – not sort of – he does have the traits of an addict. And yes, he was a victim of abuse when he lost his mother. I think Harry’s steering him towards being a serial killer was also a form of abuse. But yeah, it’s interesting because this is also a father. So I don’t know how interesting this will be for the audience, but I wonder what kind of father he’ll be – what kind of son he’s producing? Ron Bennington: Well even this year, the fact that he still goes on – let’s suppose he is an addict, right? He can’t be trusted because he chooses his addiction over his son. He chooses his addiction over his sister. And the fact that she’s trying to make deals with him – it can’t be done. In the same way that you can’t make a deal with an addict. Ron Bennington: This show’s turned nuts.Jennifer Carpenter: And in this last episode, he claims it’s all in his control – like an addict would. Like it’s a problem, but he’s got it. Ron Bennington: But I do think that this season will be the angle of – is it going to be a morality tale or not? Is it just to titillate the audience or is there something to learn from this? Jennifer Carpenter: That’s one thing I like about the show, is that at the end of the episode, we don’t tell you how to feel about anything. Ron Bennington: How many people do you think have been killed there in Miami over the years down there? Jennifer Carpenter: (laughs) All the serial killers live in Miami. I don’t know. I feel like Michael (C. Hall) has kept track of how many people have been killed on the show. Ron Bennington: You think he actually has the number? Or little slides that he actually keeps for himself. Jennifer Carpenter: I don’t think he keeps the trophies. (laughs) But it’s so funny like he’s such a great reference because I can say – what was the episode and what year did this happen and that happen? And he’ll say what episode and what season and what he was wearing that day. Ron Bennington: It’s a really interesting thing because I think the thing about his character is that he has always stayed so small and then when he goes big – it’s shocking. And your character stays big and then when you go small – it’s shocking. So, it was kind of weird for us to see you, this season, get clobbered with this – take the full brunt of this thing. Jennifer Carpenter: A lot of this year was really confusing because I feel like there’s so many growth spurts happening so quickly. I kept going to the writers going – what are you asking me to build? Like what am I laying in for you? Tell me where you’re going. And they’re like – oh, you’re confused. It’s okay because she’s confused too. So there was really no help. It became about me just making decisions on the day as quickly as I can. And some of the stuff coming up is really exciting. Like I think I made some really bold choices in Episode 8, which will change how I play the rest the series. And it’s so awesome because it’s happening like real life. Ron Bennington: As an actor, what’s it been like to have been on this kind of run? 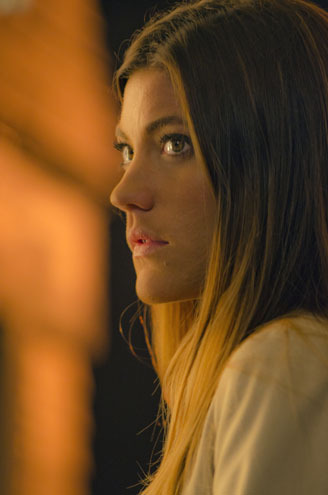 Jennifer Carpenter: I was so green the first season. I barely knew how to hit a mark. I didn’t know how anything worked. Luckily, neither did Deb. But it’s been an incredible learning curve and it has been difficult on some many levels – challenging on so many levels that it’s been like a real education. I feel like every other job I have on hiatus feels like smooth and easy. It’s a gift. Ron Bennington: And you’ve done theater here New York. You’ve done movies and stuff. But does “Dexter” even prepare you for those type of things or do you have drop everything? Jennifer Carpenter: Absolutely. Because it’s all about preparation. If you show up prepared every day and you’re ready to turn on a dime. In TV, you have to – because what you think a scene is about – the director wants you to go in a totally opposite direction. Like I feel like I can pivot like a pro ball player. Ron Bennington: You knew last year when you shot that last scene that everything would change for you. How much warning did they give you of where you were going? Ron Bennington: None at all? Jennifer Carpenter: None. None at all. I knew a couple of big moments were going to happen, but that didn’t help me at all. It didn’t help me plan at all. (laughs) The hard part was finishing Season 6 watching the knife go into Travis and then waiting 8 months and coming back and getting in the same clothes on that same set and going back to that very moment. And then trying to pick up where we left off – that was a challenge. Jennifer Carpenter: The plastic wrap. Ron Bennington: Yeah, the plastic wrap. And then…wait, was your wife…? And it’s almost like this wave that hit her was too big to even take it on at the same time. Jennifer Carpenter: Well, I think Debra had a lot of things that need to be buried. A lot of relationships, a lot of bad memories – my God, her mother died of cancer. It just goes on and on. Like if she was really sifting through these things then how would she go to work every day? So, I think she puts things away and like in life – you can’t help it – sometimes they just creep up and you have to acknowledge them to move forward. Ron Bennington: She does have bad luck She picks terrible guys. Jennifer Carpenter: Well, Dexter is her bad luck. He’s the magnet that keeps attracting all this bad luck. Ron Bennington: And yet, last season, she had like a crush going on with him. Jennifer Carpenter: Yeah. She loves him. He’s the only family she’s ever known really. Ron Bennington: Are we going to make it through the next 2 seasons? Jennifer Carpenter: Oh, we’re gonna kill it. Ron Bennington: I mean if you had to guess, does Dexter die? Jennifer Carpenter: I don’t know. He can’t totally get away with it. I mean that wouldn’t be very satisfying. I don’t think, but I mean – I’m so glad that that’s not up to me. Ron Bennington: And we don’t know now if – for all we know, Deb’s going to be Dexter too by the time this thing is over. Jennifer Carpenter: No way. No. I don’t think so, no. I mean have we met Deb? Deb is a cop. She bleeds blue – that would not – that’s not who she is. Ron Bennington: And yet, she found the perp and didn’t bust him. Did not bust a murderer. If you really look back on this – if Dexter goes down, Deb could go down right now. Because she’s not being a true cop. Ron Bennington: Right, but what would we say about a cop who covered up for either a fellow cop…it’s the worst kind. Jennifer Carpenter: But it’s the same thing that’s going on with Dexter, but is he in the end saving lives? Is Debra in the end, getting the bad guy? And saving the good guy?